Clothes Hangers — How Do Yours Stack Up? Clothes: We know you’ve seen them before: the dreaded “hanger shoulders”..those puckery marks that scream “I was just on a wire hanger and I’m salty about it”, even when you’re wearing that shirt or blouse! Wire hangers’ rectangular-like design means major stretching and not-so-nice treatment to your favorite tops. Wooden hangers, on the other hand, have thicker and rounder surface areas, which flow more naturally with the design of the garment. Just as you take care to launder your precious garments properly, the same goes for how you store them in between wearings! Environment: Not only do wire hangers wreck havoc on your shirts, blouses, and tanks, but they are made from a mixture of metals and plastics (hashtag: difficult to recycle!). It is estimated that 85% of wire hangers end up in landfills due to the difficult recycling procedures that they require. While Mulberrys reuses wire hangers upon customer request, they are still not preferred to wood, which can be broken down much more easily if and when it’s necessary. Efficiency: Wire hangers are intended for short-term use, which usually yields a shelf life of only a few months. Who has time to keep swapping out hangers?! (I want to keep trading in my cheap wire hangers for more cheap wire hangers!..said Nobody Ever.) Score another point for wooden hangers–they are built to last. Mulberrys delivers your freshly cleaned and pressed garments on wooden hangers because we care about your garments just as much as you do. But hangers are not a one-size-fits-all scenario. Different hangers have different functions, further aiding in the garment care process. 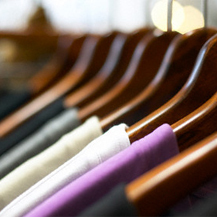 – A majority of our hangers are plain and simple top hangers, reserved for button downs, polos, and everyday tops. – Speciality hangers have particular features to keep your garments in tip-top shape–garment stoppers keep slippery tops in place and built-in notches ensure those strappy tanks don’t go anywhere but into your closet. – Pant hangers, while great for keeping pressed pants crisp and clean, are also used to hold folded sweaters that are too heavy to hang (no one likes a saggy sweater!). And, as always, when you’re finished with your Mulberrys wooden hangers, bring them in with your next batch of laundry–we would be happy to recycle them to make future garments happy.